I wanted to own an Apple MacBook for long. Very long. Since I turned an independent consultant, I thought why not go for a MacBook? Install & uninstall experience - Drag and drop into ‘Application Folder’ for install; drag & drop into ‘Trash Can’ for uninstall. Just as simple as that. No registry; no clean-up of messy folders. Mac OS folks have done really good design and it is simply superb. No shutdown - Okay, not necessary to shut down. Close the lid and its off; Open and start working. Cool, isn’t it? Spotlight - something like desktop search. It is quick and precise (only once it didn’t return what I was looking for). Web Browsing : Mac comes pre-installed with Safari, which is a fast browser. I am also using Firefox. Email : Mail, the pre-installed email program doesn’t have a provision to download only the headers. I’m using Gmail with offline feature and it is more than sufficient for me. RSS Feedreader: Again I depend on Google for it. I’m using Google Reader with offline feature. Office Suite : I’m using the Apple iWork. Might give a try to NeoOffice. Games : I’m surprised that Mac doesn’t come with pre-installed games pack. There is only chess. I’m searching for some good free games. Chat: My chat buddies have grown old (no I’m still young ;-) ). Everyone in the current friends circle use Gmail chat and so I go with it too. Programming : I’m using TextWrangler for coding. But couldn’t find a decent SVN client. I tried SCPlugin, but for some reason it didn’t work. Photography: I’ve been using Adobe Photoshop Elements and it worked in Mac too. Still to edit any photo in Mac but I’m sure the experience is going to be good. Note Taking : Voodoopad Lite is a desktop wiki for Mac and it makes it easy to takes notes and organize within a single physical file. Personal Finances : I tried mmex. But it kept crashing, though it works fine under Windows. 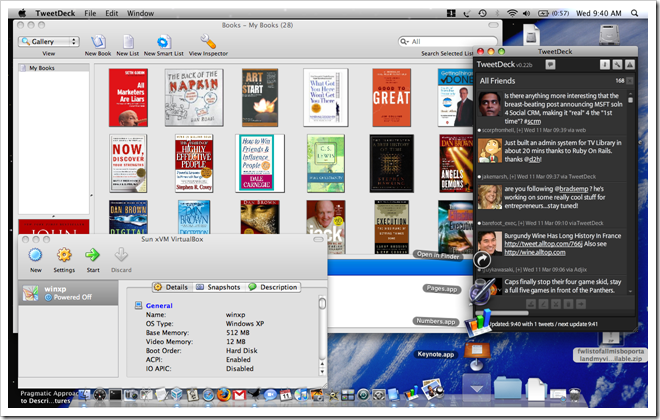 VirtualBox : I couldn’t find a decent Desktop Blog writer than Microsoft Live Writer; also I already bought SmartDraw. So went with VirtualBox to run Windows inside Mac. I am also using MMex for personal finances under Windows. Others : iSync for syncing addresses & calender from Nokia E71; TweetDeck for tweets; SLife for tracking hours spent on applications; Books for cataloguing; Grab for taking screenshots. Are there any other interesting Mac applications (preferably free) that I should try?